Magento Improved Sorting Extension 🥇 Sort by Newest, Bestsellers, etc. Let your customers find the best products fast! Give them effective options for sorting - by bestsellers, biggest saving, etc. Add featured product blocks based on the sorting options for different categories. Looking for an easy-to-use tool to enhance customer shopping experience and increase your conversion rate? With the Improved Sorting extension customers will be able to easily sort products by various parameters according to their needs. The more user-friendly your site is – the more orders you get, everybody wins. Although it’s difficult to predict which products will become Magento bestselling products, at the same time a few really popular items can generate the vast majority of store revenue. Then why not help your cash cows generate even more profit? With the Improved Sorting extension bestselling and highly rated products will be automatically pushed to the top. Apart from that, you can manually manage the order of products for some options and create featured product blocks. Each store highlights its bestselling products, as high sales demonstrate that a product is great. It also encourages customers to make their choice much faster. Thus, ‘Sort by popularity’ option will help to increase your conversion rate by drawing attention to any Magento bestseller you need. You can also specify the period, for which the sales are counted, for example last 100 days. Even tempting deals won’t work for your business when customers can't find them. 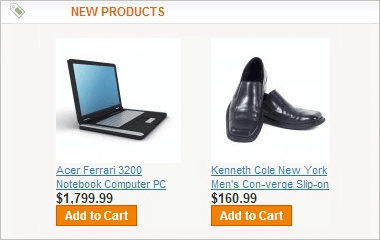 This magento product sorting option displays products based on the difference between regular price and special price. The bigger the difference - the higher the product is placed in the list. It will be very popular while holidays, as people are used to getting discounts during such periods. So, don't miss the chance to properly show your specials. Sort products by the highest percentage of discount with the ‘Biggest Savings’ ranking option. When customers click on the ‘Magento sort by newest’ option, new items are displayed at the top. And as soon as store visitors always tend to buy new products, this option will work for fashion stores, mobile phone stores and other sites of the kind, where people always look for new trendy things. You can use a custom date attribute to manage the order of products’ display for this option. You can specify any preferred order for the sorting options in the Sort by dropdown. Depending on the products assortment of your web store, you can set the most effective (or demanded in your opinion) sorting options to the top of the dropdown. Specify the way the products should be sorted on the search result page and on the categoty pages. Set the priority for the sorting methods: specify the primal method and the following two algorithms. Have a full control on how to display the products in the most favored way for you. When shopping, people are more likely to choose products with positive feedback from real customers than the products with just catchy banner adds. And, of course, there's nothing they will trust more than rating and reviews. Many people buy things, which other people have or want to have. Also best-selling products may be difficult to get in holiday season. 'Now in Wishlists' will show products that are most frequent in wishlists - people will be afraid to miss the opportunity to get them and will place orders faster. 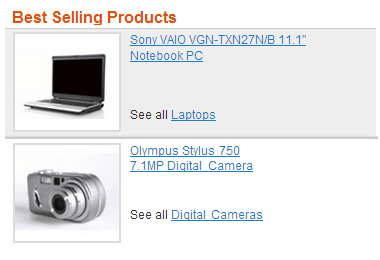 Magento ‘Most viewed products’ option is a real must-have for new sites, which can’t boast of numerous orders. Views are generated much faster, so you can easily demonstrate the most popular products to customers and motivate them buy more. The ‘Most viewed products’ Magento feature also enables you to specify the period, during which the views are counted, for example last 100 days. This type of sorting is useful for wholesalers, who buy products in large amounts. Now they can easily find out which items have the most stock. With a set of new sorting options admin users can display the most profitable (or the least profitable) products in sort results and featured blocks, thus effectively regulating sales of particular products. Sorting works both for products from the catalog and key word searches as well as layered navigation pages and landing pages generated by Landing Pages extension. Create a sidebar block with Magento most viewed products or a top block with bestselling products and so on. Use templates provided by the extension or make your own ones. Create featured product blocks of your Magento bestsellers, most popular products and other sorting types. Check out the extension demo for some examples of such blocks. YAdd product blocks to any Magento page. In the blocks you can show products from the category they are displayed in or from any category you specify. The extension automatically prioritizes products based on the sales amount or the number of views. If you want to manually move particular products up in the Magento bestsellers and most viewed lists to sell them quicker, this is also possible. At the top of a product list it’s better to display items which you can sell right away. Customers will still be able to see and search for out of stock products. This feature has an effect only on catalog pages and can be disabled if necessary. If you allow backorders, some products may have inventory status 'in stock', even if their quantity is zero. You can display such products at the end of the product list, when needed. When you do a search in Magento store, the results are shown in ascending order of creation. This means that older products are shown first. Though for business it would be much better to emphasize best sellers or biggest savings. Now it is possible to set default sorting for search results page and for advanced search results page in just a click. In Magento ‘sort by’ options have ascending order. It means that, for example, you can’t display most expensive items at the top. The extension enables you to sort magento products by price from high to low. This option is also applicable to other sorting types. Make any of the new sorting options default both at the catalog and category level. With the Magento category order feature you can change sort orders on a per-category basis and even change the default sort order per category. You can disable any of the new sorting options both at the catalog and category level. The indexing mechanism ensures your category pages are loaded fast even if you have a very large catalog. Magento product order extension enables customers to apply all sorting options to product lists generated by layered navigation. Sort order Magento tool supports MySql Fulltext search engine. Solr support will be added in the next versions. With Search Pro extension you will significantly increase relevance of search results. Module allows to specify search priority for attributes, choose the search type (‘like’, ‘fulltext’ or ‘combined’) and provides you with highly-configurable autocomplete feature. Use Landing pages as a tool for quick and convenient creation of landing pages. The module lets you decide which content to display on the pages - selected products, banners, text info, CMS blocks. You can specify custom meta tags and short SEO url for each landing page. You can also experience the power of 7 modules combined into one Improved Layered Navigation that lets shop by brands, filter out products with AJAX, have horizontal or vertical menu, use price sliders and numeric filters and more. Also, if you want to optimize your product images without losses in quality try our Magento Image Compression tool. To see the way Improved Sorting works please watch the extension video review. Does the module work for the Enterprise edition? Yes, the Improved Sorting module works with the Enterprise edition. Improved Sorting module supports all types of products. Read on to learn all the nuances. Yes, the extension allows you to set any sorting option as default, you may sort products by newest or best sellers by default. To see the configuration follow the link below. Yes, with the category order feature you can change the default sort order per category. Thus, any category you need can be assigned a category sort by best seller, new, most viewed, etc. Read on to get complete instructions. Yes, the 'sort products by popularity' feature will help you make sales more efficient, as you can bring to the top any product you need despite its actual data. Go on reading to see more details. How does a best sellers sorting option handle configurable products? A best seller for a configurable item is a sum of sales of all the simple products associated with it. The module works perfectly, we have used it more than once for our projects. Once only we had a conflict with another extension in one of our projects but the support by everyone in Amasty was immediate and swift. Your support is greatly appreciated guys. Thanks a lot. The module works as described and the support team are speedy, efficient and courteous. There was a conflict with other module we use so sorting did not work for search results. They fixed it for us and module is working now. Excellent addition to our store. We had one implementation glitch and the support staff answered our inquiry immediately and took charge to fix the issue. We have not launched our store live yet, but this is working very well in development testing. Needed some tweaks to make it work properly for our store and the developer promptly assisted. Works great with excellent customer support. Would recommend. I bet this is one of the greatest tools for huge stores with hundreds of products. Sorting works like a well oiled machine and since the extension installation we've never received any customer complaints. The latest update with new sorting options are more likely to be made for admin users rather than for store visitors. And it works fine for featured blocks. I've used this extension for several clients. The fact that they can create templates and have dependent custom options with images associated with them is so useful. Custom developing all of this functionality would cost $10K+. Very thankful for this extension. Does just what it says and comes with lots of customizability, especially the function to manipulate the "best sellers" search with your own custom data. We had a conflict with the Mana SEO module and Amasty support fixed everything for us. Had a small issue, but Amasty responded quickly and professionally. Absolutely worth the small investment! We upgraded to Magento 1.8.1.0 and had problems with the change in the way the Sort Order displays products on the Category page. Using this extension and setting the products to display by 'New' resolved the issue and gave us a matching Sort Order to the previous version of Magento. One feature request: It would be really handy to be able to change the 'Direction' within the admin. However, it was simple enough to change in the extension code. Plugin works great and developer Dzmitry provided great support very fast for requested customizations. I purchased this extension first in 2012, and recently needed some help with a modification due to a conflict with another extension. The developer helped me right away and fixed my problem same day. Great service on top of a great product. Works like charm, and the support helped me incredible fast. In my case installation passed painlessly and we didn't have to fix any issues as there were no conflicts with other already installed modules. It really helps our visitors faster find the items they need that is positively reflects on our conversions. I have searching for a module like this for months ..... It does what it says, it works OK with my custom theme fortis. I had some extension conflicts with other module (Advance Navigation) and the support team was great, very proffessional, very quick. Thanks Amasty for the great work. Keep it that way. It has great bestseller / most viewed in X days options. Also biggest saving feature is my favorite. Very great extension i recommend, i bought many extensions from amasty company, easy installation and fast response and experienced fix if there is Conflict with your website, many thanks! Just installed this without backing up(HAHA). Worked right out of the boxed after copying the files and as intended. We use that extension for almost 1 year now and are pretty happy. Its really useful, especially for our customers. The latest improvements, like setting a timeframe-period for the bestseller items make it a must have in our shop. Great support. I had trouble with getting the sorting to work on the Search Results page, they emailed me a solution within 24hours. Really impressed to see it working with it's own separate index and including bundle products too. Good work! I think our new store will have just about every Amasty extension going! By default, magento should be having those sort options. It is a known fact that magento community version still lacks a lot of basic features. and sorting by best seller was on of them. we have been ranking in google for a high volume search term and we have a good number of visitors and a huge catalog of about 1000 items. but we always only got about 80-90 orders at max. that left me to think that something could be wrong. and, i went to amazon to see what they have that we were lacking. And, when i looked into their catalog, they always displayed items by their best sellers. And, this is where magento lacked and we too as an ecommerce store offering such huge variety of items missed out on the point that customers are HEAVILY INFLUENCED by what others are buying and they want to quickly buy what have been selling well. I love this extension. It is very important that buyers have the ability to sort products by different parameters. I think every store should have such functionality. Does exactly what you expect, has an issue between 2 extensions and these guys sorted in very quickly. Simply great extension, just what I wanted. It allows users to sort product by the variety of factors which are important to them: biggest savings, best price, best ratings, etc. In my opinion, each descent store should have such sorting. Thanks to Amasty for great extension! Very useful extension as magento's default sort-by options are rather limited. Also have to mention the excellent support. I had a conflict with another extension and they had no problem with fixing it for me nice and quickly. Highly recommended. Well done extension with great support. Especially the option to sort "out of stock" products last without breaking the selected sorting method is very useful to raise conversion rate. – Ability to set default sorting for search results page and for advanced search results page. – Better compatibility with Landing Pages module. – Ability to manually manage the order of products for bestsellers and most viewed options. – New sorting option by 'Quantity'. – Ability to specify category for products blocks. – Ability to create product blocks based on sorting options. For example you can have a sidebar block with best-selling products or top block with new products. – You can either use predefined templates or create your own custom templates for the product blocks. – Out of stock items are displayed last only for catalog pages, search results remain as are. – New sorting options 'Biggest Saving', 'Reviews Count' and 'Now in Wishlist'. – Optional indexing to improve performance for large catalogs. – Ability to disable sorting options. – Ability to have descending sorting by default. – Ability to show products with zero quantity at the end of the list, even if their inventory status is 'in stock'. – Compatibility with new version of Improved Navigation. – Posibility to define which sorting options should be used for which category. 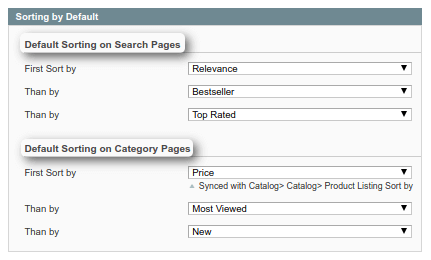 – Ability to configure calculation periods for 'Bestseller' and 'Most Viewed' sorting options and other settings. – Bugfix of translation and default sorting issues. – Added sorting by the the number of views. – Sorting order for New products set to descending by default. – Added sorting by the date the products were created. – Compatibility with Magento 1.3. – Admin can now set sorting by bestsellers or rating as default.